G’day, and thank you for stopping by my HubPages profile. My moniker is C-Bless because I have a personal relation with Christ and “C” is also the first initial of both my first and last names. For years, I've been asked or told to "do something" with my writing, and I am now ready to pick up the challenge to go forth and scribe. There have been some valleys recently but strength comes from going through the valley which brings along new strengths and hope.. 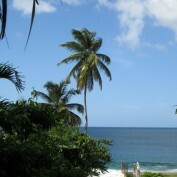 The photo on my HubPages profile is from one of the scenic rooms-with-a-view from my favorite vacation spot in the Caribbean: Tobago. Power-walking is my preferred form of outdoor exercise while reading has remained my favorite solitary thing to do indoors.